Since it is now unlikely that these stories will be published, I will share them here. All characters, of course, are copyright DC Comics. This installment: Batman and Captain Comet. In a particle accelerator lab, a boomerang whizzes by. In space, a comet whizzes by. The boomerang snags a gun out of a security guard’s hand and begins its return. The comet arcs across the sky over Earth. Seconds before the boomerang reaches a black-gloved hand, a Batarang knocks it away. Like your weapon, Captain Boomerang, you’re about to return to where you came from—prison. Captain Boomerang takes out another boomerang. Fighting crime the night Halley’s Comet is passing by Earth, Batman? But it’s a shame to miss that—it won’t be back for 76 years. Bats aren’t nocturnal for the stargazing. A small blade slides out of both ends of the boomerang. Here’s something to keep your eye on instead. Captain Boomerang hurls the boomerang at Batman. Batman hurls a bat-shaped magnet toward the boomerang. The problem with your gimmick, Boomerang—it’s always predictable. The magnet draws the boomerang to it. Being close to a large metal object (door, machinery, telescope-like-thing—doesn’t matter), the magnet—now attached to the boomerang—smacks against it. Another boomerang rockets past Batman from behind, clipping off one of the ears of his cowl. Captain Boomerang is smirking. Batman looks genuinely surprised (and will go the rest of the story with one cowl point missing). I threw that one a while ago. Predictable, huh? You’re wasting my time, Boomerang. I was supposed to be apprehending Sportsmaster across town three and a half minutes ago. His gimmick is also dumb, but at least it’s diverse. Captain Boomerang is grabbing a device about the size of his torso (the purpose of which will be revealed shortly). You think I’m a joke, Batman? Next time you see me, you will not be laughing. Captain Boomerang kicks a boomerang out of his boot in Batman’s direction. The boomerang is generating smoke. And you’ll never predict why! Batman is surrounded by smoke. As the smoke clears and the boomerang harmlessly reverses direction, Batman finds that Captain Boomerang is gone. In the sky above the Batwing (that Batman is piloting away from the lab), the yellow glow of Halley’s Comet is visible—alongside another bright (but red) streak. In an outdoor setting at night, Batman is knocking out Kite Man. A glowing form descends behind Batman. Batman, we have a problem. Captain Comet! You need my help? Your IQ is stratospheric. I may be the smartest man in space, but you’re the smartest man on Earth—and this matter relates to both. Yes. But this time, it’s not going to pass by in the distance. It’s headed straight for Earth. Captain Comet is somehow indicating “I now remember”—i.e. slapping his forehead, snapping, waving his pointer finger the air, etc. Can’t you alter the comet’s path with your mind? That’s right—my telekinesis! I have so many powers that I sometimes lose track. You just called yourself the smartest man in space. A person can be smart and forgetful at the same time. But no, my telekinesis won’t work on something that big. And my psionic blasts aren’t strong enough to reroute something that fast. Then we’ve got to find Captain Boomerang. 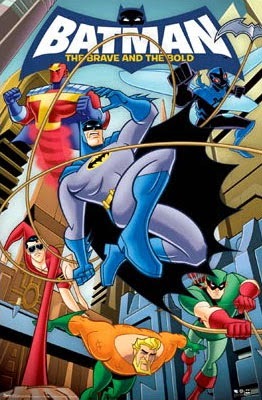 Batman in the Batgyro flies alongside Captain Comet. Boomerang always takes over locations where something returns—I’ve stopped him everywhere from a recycling facility to a mail-in rebate center. Batman is looking at the sky, where the returning comet, now visible, is much closer (i.e. larger and brighter) than it should be. We don’t have much time. Do you have super-speed? Super-speed, super-speed…I don’t think so. That I do have. Wait, nope…I’m thinking of someone else. Anything that could get this done quicker? Of course—where the tide ebbs and flows. Not to mention where he has an unobstructed view of the sky. Batman and Captain Comet arrive at the shore, where Captain Boomerang is on a boat aiming a sophisticated remote-control-like device skyward—but he looks panicked, not pernicious. Boomerang! Divert the comet now! Batman in the nick of time! And you call me predictable! Captain Comet lands next to Captain Boomerang as Batman jumps to the boat from his ride. You heard the man, Boomerang. Whatever you did to send the comet this way, undo it. I’ve been trying! But this tech I stole from that lab works only halfway! I recalibrated it to change the comet’s path but I can’t reverse it! I hate when things don’t go back where they came from! Captain Boomerang smashes the device against the boat. Captain Boomerang picks up one of the pieces—a small glowing puck. This is the power core. Somehow its signal is no longer working from a distance. I think our last chance to save Earth is to plant the power core directly on Halley’s Comet. Captain Comet—can you get that close? Batman takes the power core from Captain Boomerang. I know this one! Yes! I regularly create a shield to protect myself from the extremes of space…but I couldn’t fly up to the comet in time. Yes you can. When his crew is in danger, a captain rises to the challenge to save them. You’re so powerful that you might be able to will yourself a new ability as needed. Batman hands the power core to Captain Comet. And once this is attached, hit it with both a telekinetic and a psionic blast. I’m gambling that will act as a super-charger, sending the comet in whatever direction you choose. Captain Comet takes the power core. Everyone is sweating. This is why I sought out your help, Batman. Proves how smart I am. Captain Comet blasts off toward Halley’s Comet. In space, Captain Comet shoves the power core into the comet. Backed away, Captain Comet blasts the power core with two kinds of blasts as Batman suggested. Half page showing the comet dramatically reversing course, heading back into space. Sparks and licks of intense flame flying everywhere. Batman and Captain Boomerang looking up at a spectacular light show. The comet that was large last time we saw it is now a speck. A good Captain can always change course. Captain Comet returns to Batman and Captain Boomerang. I’m going to hold on to this super-speed. I didn’t intend this—I didn’t want to destroy the planet! After all, I can’t get rich if I’m dead! I just wanted to show you that I’m not a joke! And don’t forget I showed you the power core! All you showed is that you deserve a longer sentence than ever before. Captain Boomerang throws boomerangs (that are giving off electric charges) at Batman and Captain Comet. No! That’s the one place I will never go back to! As Batman and Captain Comet each catch one of the boomerangs, Captain Boomerang leaps overboard. Captain Comet is poised to go after Captain Boomerang but Batman is putting out his arm to stop him. The heroes see a nearby Coast Guard vessel fishing Captain Boomerang out. The Coast Guard captain is delivering Captain Boomerang to the (costumed) heroes.